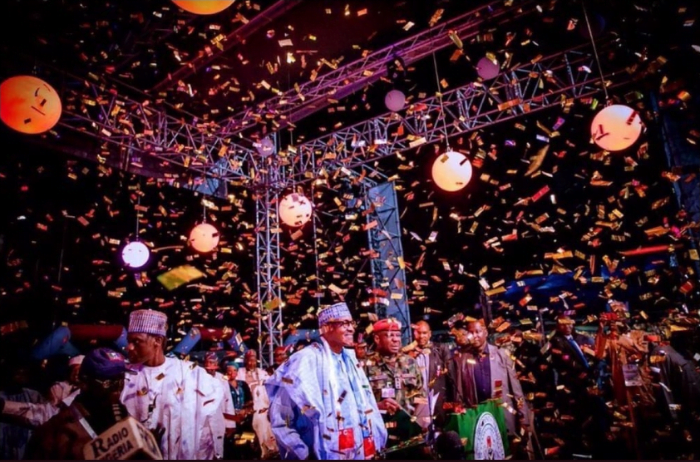 Buhari was on Wednesday declared the winner of the just-concluded presidential elections following his re-election bid on the platform of the All Progressives Congress (APC) with a total of 15,191,847 votes, beating other contenders. Reacting, celebrities took to their social media platforms, to express their satisfaction with the new turn of events. Actress, Joke Silva, on her official Instagram, @ajokesilva wrote, “Congratulations. Well done. League of extraordinary gentlemen. Now hit the ground running. Consolidate. Also actor and politician, Desmond Elliot, who is a member of the Lagos state House of Assembly, also expressed joy. He wrote, “Congratulations!!! May this new administration take us to greater heights as we consolidate and build a firm foundation may we speedily begin to reap the fruits of our labour as a nation. Meanwhile, singer Banky W, who contested for a seat in the Federal House of Representatives, Eti Osa Constituency, under the Modern Democratic Party (MDP) and lost out, in a viral video, expressed appreciation to his supporters. He urged youths not to give up their dreams, adding that his loss in the just-concluded election was not the end of his political career but the beginning. “Hope we look back at what we accomplished in just three months and he shows us what we can do with the next four years. I hope we realize that winning in some parts of Eti-osa is proof that we can do this anywhere. “The real MDP logo is a ladder, I hope we are not tired yet of climbing . I hope we remember all we said all along, that no matter the outcome, Election Day was never our finish line, it was only our starting point. “I hope we made our generation proud, we were greatly outnumbered but we stood out in the crowd . The movement must now begin where the campaign ends. “This was never a three month race, it is a lifelong commitment…may we still fix Nigeria, one community at a time,” he said.